? 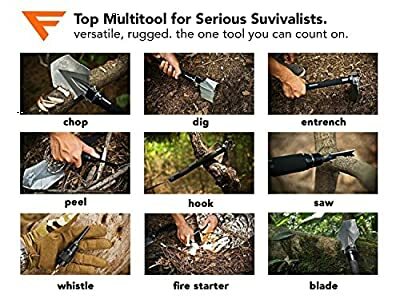 ALL-IN-ONE SURVIVAL TOOL - Heavy Duty Shovel, Sharp Axe Blade, Serrated Saw Edge, Hammer, Paracord...Check! We've got all the must-haves for surviving in the outdoors covered. Conveniently dig trenches with this versatile multifunctional tool with a hidden rescue knife and saw, emergency whistle, fire starter (magnesium rod), bottle opener, and more! ? 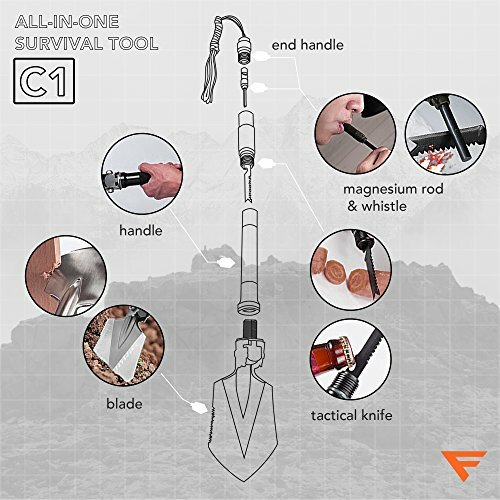 COMPACT, PORTABLE MULTI TOOL - Lightweight (only 1.2lbs), and amazingly compact, this is an essential gadget to add to your outdoor first aid survival kit/ gear. 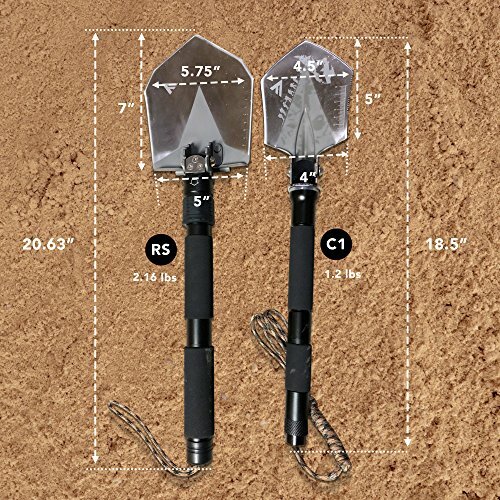 Easily fit this foldable entrenching tool in your backpack, or the trunk of your vehicle. Dig your car tires out of snow, mud, or ice, or use the shovel head as a glass breaker in an emergency. Attach the included carrying case to your belt for convenient access while on the trail or hunt. 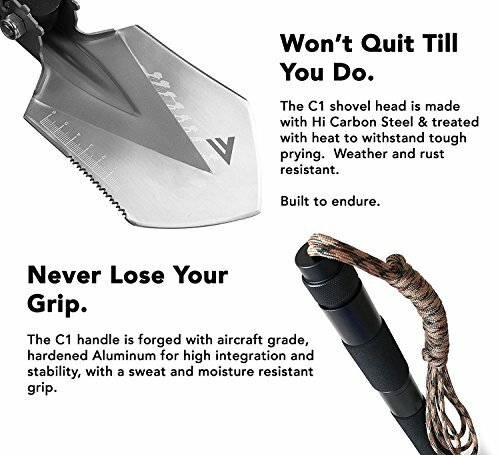  VIRTUALLY INDESTRUCTIBLE - Forged from heat-treated High Quality SOLID Carbon Steel (Blade and Knife) and Aerospace Grade Aluminum (Knife), for maximum strength and lifetime durability. Rust, water, and fracture resistant. Go ahead- PUT IT TO THE TEST! 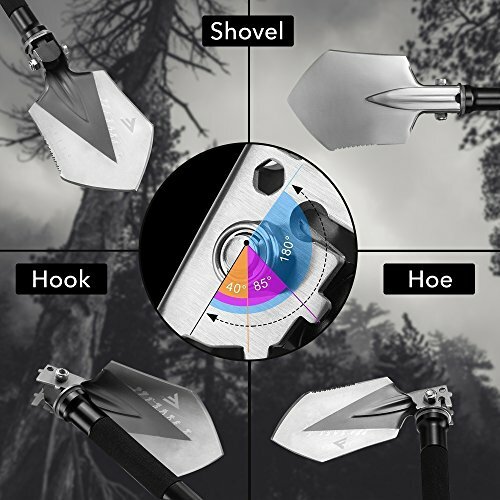  UNIQUE LOCK ADJUSTMENT- Unlike other shovels, you can adjust the shovel angle with it's special screw locking device, making it simple to alternate functions and positions. 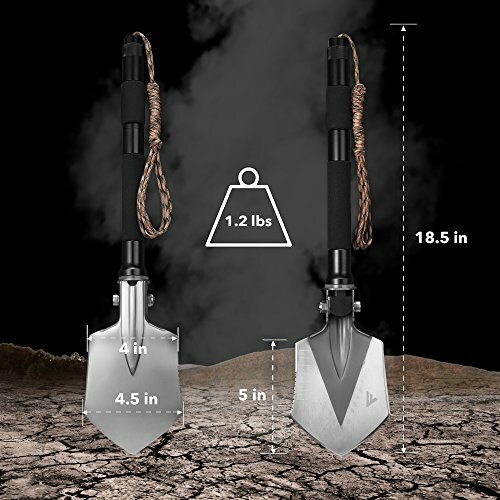 Spade can be used 40°, 90° or 180° angle as hook, hoe or shovel. ?? ERGONOMIC DESIGN - Thoughtfully engineered handle optimizes comfort and control for all glove types to minimize hand fatigue. Slip proof foam cushion on the aluminum handle is water resistant, quick to dry, and perfect for recreational gardening or on your backcountry hike or cross country trips. Always be prepared with this tactical folding tool!